The total number of votes was 2,624 (which includes write-ins and no preference). The number of ballots expressing a preference was 2,605. Therefore 1,303 votes were needed to attain a first-round majority, which Helsinki achieved. Westercon 68, held this weekend in San Diego, had 945 total members reports Mike Willmoth. The number in attendance has yet to be released. Site Selection: The unopposed bid for Tempe, Arizona won the right to host Westercon 70 in 2017. According to Kevin Standlee, Westercon 70 has only one confirmed GoH at this time, local author Gini Koch. Smoffing: Lisa Hayes’ videos of the Fannish Inquisitions held at Westercon are already online. Who’s bidding for the Worldcon? Here is a summary of ongoing bids pieced together from the presentations at LoneStarCon 3, the 2012 Smofcon, plus other online discussions — and my own Machiavellian speculation thrown in for seasoning. There is an unopposed bid for Kansas City. Kansas City, Missouri: KC in 2016 proposes to hold the con August 17-21 at Bartle Hall and the Kansas City Convention Center. Kansas City is a sentimental favorite in some quarters after losing three Worldcon bids in a decade — 2000 (chairs Jim and Susan Satterfield), 2006 and 2009 (both chaired by Margene Bahm). The current bid’s co-chairs are Diane Lacey, Jeff Orth, and Ruth Lichtwardt. The committee is Chaz Boston Baden, Margene Bahm, Warren Buff, Aurora Celeste, Glenn Glazer, Barry Haldiman, Sheril Harper, Parris McBride Martin, Tim Miller, James Murray, Paula Murray, Mark Olson, Priscilla Olson, Jesi Lipp Pershing, John C. Pershing II, John J. Platt IV, Keith Stokes, Beth Welsh, Ben Yalow, Jim Young. George R.R. Martin has plugged the bid. There are four bids in various early stages of activity, Helsinki, Montréal, “Northeast Corridor” (USA) and Nippon. Helsinki, Finland: This is a rollover of Helsinki’s narrowly-defeated bid for 2015. Eemeli Aro will chair, with Karoliina Leikomaa as the bid’s Project Manager. Other committee members are Crystal Huff, Jukka Halme and Hanna Hakkarainen. They propose to hold the convention in August 2017 at the Messukeskus, the Helsinki Expo and Convention Centre. The committee has posted details about its goals here, adding that 2017 is Finland’s centennial year as an independent nation. One bidder observed that many Helsinki supporters who voted in the 2015 race will acquire supporting memberships in the Spokane Worldcon, making cost less of a factor in qualifying as 2017 site selection voters. I still wonder how the Helsinki committee resisted the temptation to bid for 2016, whose Worldcon site will be decided by members of Loncon 3, among them a very large number of European fans. 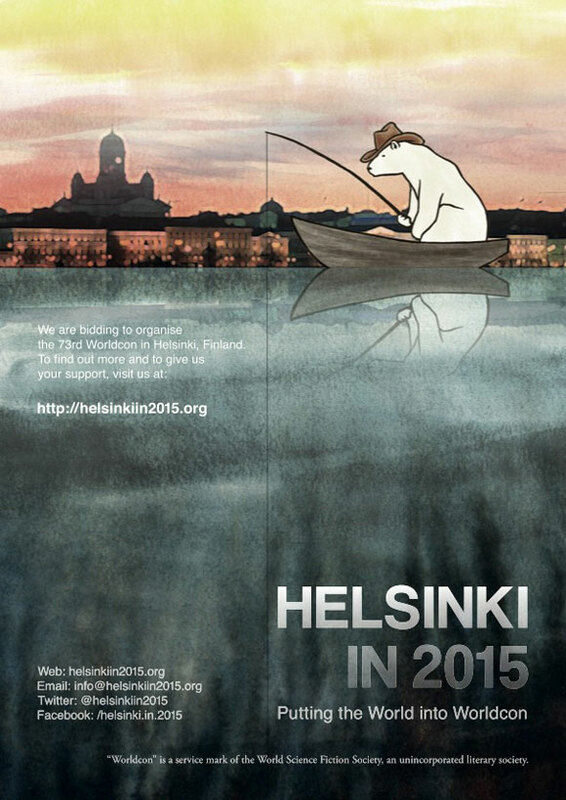 URL: http://helsinkiin2017.org/ — presently just leads to a Google doc of the bid announcement. Montréal, Canada: Originally announced as a 2019 bid, the Montréal committee has now set its sights on 2017. The Montréal group proposes to return the Worldcon to the Palais de Congrés, the 2009 Worldcon facility, over August 17-21, 2017. When questioned at the 2012 Smofcon, Montréal responded that its bid co-chairs are Terry Fong and Diane Lacey, and the committee presently included Robbie Bourget, Liz Cano, Bruce Farr, Terry Fong, Eugene Heller, Dina Krause, Diane Lacey, and Jannie Shea. René Walling, who chaired the 2009 Wordcon and made Montreal’s original bid presentation at the 2011 Smofcon, is no longer named as a member of the committee. The bid has no dedicated online presence – webpage, Facebook or Twitter. NEC (Northeast Corridor): Despite a bidcom that combines the crews of BWAWA, Inc. (Baltimore-Washington Area Worldcon Association) and SPRAWL (the Sprawl in William Gibson’s fiction is a colloquial name for the Boston-Atlanta Metropolitan Axis) no one has suggested nicknaming the bid 17 for ’17. But I have hope. The entire list of cities under consideration by NEC has not been published although Laurie Mann has not been shy about the fact that Pittsburgh is one of them. Washington D.C. and Baltimore have been named elsewhere. Warren Buff and Michael Nelson say they are working with several venues and have offers from most of them. Kris “Nchanter” Snyder is also a bid member. Recent construction in the Washington D.C. area has made the city a viable Worldcon candidate once again. Washington DC’s Walter E. Washington Convention Center opened in 2003 but not until November 2011 was ground broken on a 1,167-room Marriott Marquis across the street. Fans have long considered such a hotel the essential missing piece in any plan to return the Worldcon to Washington. At LoneStarCon 3 Buff promised details will be revealed in December, which I expect means at Smofcon. Nippon: The Nippon in 2017 committee has shortlisted three cities as possible sites: Yokohama (where the 2007 Worldcon was held), Chiba, and Shizuoka. They would hold the con in August. Members of the bid are Andrew A. Adams, Masaharu Imaoka, Mutsumi Imaoka, Kyoko Ogushi, Hideaki Kawai, Koji Kurakata, Tomoki Kodama, Trevor Knudsen, Shigeru Hayashida, Vincent Docherty, Mike “Sparks” Rennie, Megan Totusek. The Nippon in 2017 bid is immediately handicapped by questions about the huge loss incurred by the 2007 Worldcon in Japan whose full dimensions were not revealed until 2012. Bid spokespersons say funding for 2017 is separate. In a move to bolster their credibility they’ve added Vince Docherty to lead the finance division. A great deal more will need to be done to persuade voters that it is economically practical to hold another Worldcon in Japan. A New Orleans group is considering launching a bid. Members of the New Orleans in 2018 Pre-Bid Committee are Raymond Boudreau (Chair), Michael Guerber, Cordelia (Colin) Murphy, Rebecca Smith, Jessica Styons and Kendall Varnell. Committee member Jessica Styons told File 770, “Obviously we are in the early stages of building support, gauging interest and staking a claim but we are interested in all comments, offers of support and assistance.” Rebecca Smith, chair of CONtraflow, is part of the bid. Two bids are on the radar for 2019. Dublin, Ireland: James Bacon unveiled the Dublin bid at LoneStarCon 3 and it will officially launch next year at LonCon 3. They propose to hold the Worldcon in the Convention Centre Dublin (CCD) from August 14-19, 2019. There are 1,268 hotel rooms are available within 850 meters or half a mile of the convention center. Shelly Coleman, Carol Connolly, Pat Fanning, Malcolm Hutchison, Gareth Kavanagh, Dave Lally, Ted Lee, Ruth Long, Aisling Lynch, Cat McGrath, Maura McHugh, Alissa McKersie, CE Murphy, Sonia Murphy, Brian Nisbet, Mick O’Connor, Rod O’Hanlon, Peadar Ó’Guilín, Trish O’Flaherty, Sorcha Power, Helen Ryder, Philippa Ryder, Lynda E. Rucker, James Shields, Sten Thaning, Julian West, Nicholas Whyte. Eemeli Aro, Claire Brialey, Liz Batty, Steve Cooper, John Dowd, Vincent Docherty, Carolina Gómez Lagerlöf, Deb Geisler, Colin Harris, Nigel Furlong, Mark Herrup, Edward James, Alice Lawson, Mark Meenan, Farah Mendlesohn, Helen Montgomery, Mark Plummer, TR Renner, Ian Stockdale, Geri Sullivan, Paul Taylor, Kees Van Toorn. France: Is there a genuine French bid? Who is behind it? Is it a plan or just a wish? So far as I have been able to find out, the torch is being carried by a small number of visionaries both in and out of French fandom. Created early this year, a Paris in 2019 webpage invited queries which were answered by UK fan David Steere. He said this is a bid by fans in the UK and France that aims to launch at LonCon 3. In April 2013, Bernard Henninger collected 33 names of fans willing to support the idea. And Henninger wrote again in August that the idea created a stir at the 2013 Eurocon in the Ukraine – including a show of interest from Finnish fan Eemeli Aro. So it remains to be seen whether enough French fans want a Worldcon for a solid bid to emerge anytime in the future. The one serious bid is for New Zealand. New Zealand in 2020 is led by Norman Cates, a past DUFF delegate. The general committee members are Kevin Maclean (New Zealand), Maree Pavletich (New Zealand), Lynelle Howell (New Zealand), Malcolm Fletcher (New Zealand), Louise McCully (New Zealand), Struan Judd (New Zealand), Daphne Lawless, Andrew Ivamy (Queensland, AU Agent), James Shields (European Agent). They have yet to settle on which of the country’s two main islands they’d hold a Worldcon. There are said to be two facilities in Auckland and one in Wellington that could support a 1500-3000 member con. They would hold the con anywhere from late June to late August. At LSC3 a potential 2021 North Texas bid was announced by FenCon’s Tim Miller. There are also plans for a Chicago in 2022 bid. Fannish Inquisition questionnaires submitted to Smofcon 30 (December 2012). Videos of Worldcon bid presentations at LoneStarCon 3 (September 2013) taken by Lisa Hayes. Here is a summary of ongoing bids for the Worldcon pieced together from the presentations at Chicon 7 and online discussions I’ve seen since then, with some Machiavellian speculation thrown in for seasoning. There are bids for Helsinki, Orlando and Spokane. Helsinki, Finland: The recently announced bid for Helsinki in 2015 is chaired by Eemeli Aro, with a committee of (so far) Andrew Adams, Jukka Halme, Lisa Hertel, Crystal Huff, Johan Jönsson, Kristoffer Lawson, Jeff Orth, Ann Marie Rudolph, Nicholas Shectman, Heikki Sørum and Megan Totusek. Site selection is less than a year away, but the bid has not proposed a date for the con or identified its facilities. In fact, fans feel obligated to begin a discussion of the new Helsinki in 2015 bid with mutual assurances that it is real. Not long ago the chair Eemeli Aro and two other top leaders were pushing Mariehamn, Finland in 2016, aka Wårldcon 2016. So far as the internet is aware, they still are. Yet the serious Helsinki bid is sprinting toward an immediate up-or-down vote at a North American Worldcon against two bids for U.S. cities. Do they like their chances anyway? If not, might this be a subtle way to party on with less risk of winning? Or could there be an even deeper game involved? Does the committee have a contingency plan to roll over the Helsinki bid to the better year with the benefit of increased public awareness? In recent years several other bids have kept running after an initial defeat, Chicago victoriously, but KC and Columbus both losing the second time around. Orlando, Florida: Adam Beaton chairs the Orlando bid committee. They propose to hold the con over Labor Day weekend, September 2-6 at Disney’s Coronado Springs Resort at Walt Disney World. Others on the Orlando committee in addition to Beaton are Mary Dumas, Robbie Bourget, John Harold, Eva Whitley, Lynda Manning-Schwartz, Charles Schwartz, Colette Fozard, Adam Ferraro, Pam Larson, Thomas Safer, Arthur Sanders, Katie Katz and Patricia McConnell. The bid styles itself as a revolutionary approach to Worldcon running, committing to outreach, lowering Worldcon costs, and getting the next generation of fandom excited about Worldcon. These principles are discussed in detail in “The Orlando Manifesto”. Spokane, Washington: The bid is being run by Alex von Thorn. Bobbie DuFault and Sally Woehrle are the prospective Worldcon co-chairs if they win. Spokane’s dates would be August 19-23. They propose to use the Spokane Convention Center and nearby hotels, the largest being the Doubletree, Red Lion at the Park and the Red Lion River Inn. The announced committee is: John Ammon, David Glenn-Anderson, Patricia Briggs, C.J. Cherryh, Bobbie DuFault (Convention Co-Chair), Jane Fancher, Bruce Farr, kT Fitzsimmons, Jerry Gieseke, Char Mac Kay, Randy Mac Kay, Tim Martin, Michael Nelson, Carole Parker, Pat Porter, Gerald Power, Rhiannon Power, Sharon Reynolds, Susan Robinson, Marah Searle-Kovacevic (Bid Vice-Chair), Chris Snell, Danielle Stephens, Bill Thomasson, Tom Veal, Alex Von Thorn (Bid Chair), Tracy Williams, Mike Willmoth (Hotel Negotiation), Sally Woehrle (Convention Co-Chair), Drew Wolfe, Kate Mulligan Wolfe, Chris Zach. There is a bid for Kansas City, and with caveats, Mariehamn. Kansas City, Missouri: KC in 2016 proposes to hold the con August 17-21 at Bartle Hall and the Kansas City Convention Center. They have signed a contract with the rights of first refusal with their proposed facilities. Co-Chairs of the bid are Diane Lacey, Jeff Orth, and Ruth Lichtwardt. The committee is: Chaz Boston-Baden, Margene Bahm, Warren Buff, Aurora Celeste, Barry Haldiman, Sheril Harper, Parris McBride Martin, Tim Miller, James Murray, Paula Murray, Mark Olson, Priscilla Olson, Jesi Lipp Pershing, John Pershing II, John J. Platt IV, Keith Stokes, Beth Welsh, Ben Yalow, Jim Young. No longer named as part of the bid committee is René Walling. Mariehamn, Finland in 2016, aka Wårldcon 2016: Eemeli Aro and Johan Jönsson are co-chairs, and Jukka Halme is vice chair. The bidders made a presentation at Smofcon last December and when challenged about facilities, Eemeli Aro raised the possibility of anchoring a cruiseliner in the harbor for the duration of the con. There are three bids in various early stages of activity, Montreal, New York, and Nippon. Montreal, Canada: Originally announced as a 2019 bid at the 2011 Smofcon, the Montreal committee reportedly now is setting its sights on 2017, in competition with a declared Nippon bid and a possible NY bid. The Montréal group would bring the con back to the Palais de Congrés, the 2009 Worldcon facility. René Walling, who chaired that Wordcon, made Montreal’s bid presentation at Smofcon. New York: Mr. Shirt and his wife, Stacey Helton McConnell, reportedly are considering making a run at hosting a Worldcon in New York for the first time since 1967. NYC didn’t make a presentation at Chicon 7. According to Petrea Mitchell, the New York bid did not intend to begin active campaigning until 2013. 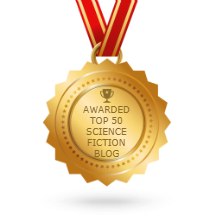 Some have expressed resistance to a Worldcon run by a pseudonym, while others are undisturbed by people using handles as their fannish identity following the example of the internet. Nippon: The official site for the bid is www.nippon2017.org which has no information at all, and a www.nippon2017.us site “independent of and not associated with the Bid Committee, but dedicated to encourage and assist them in returning the Worldcon to Japan” which has almost as little to say. Neither site lists committee members or a proposed date. Andrew Adams told fans at the 2011 Smofcon that the Japanese bid planned on using the same venue in Yokohama as the Nippon 2007 Worldcon. But information shared at Chicon 7 indicated the bid committee is looking at two other sites, also in the greater Tokyo area, in Chiba, and Makuhari Messe in Saitama. The Nippon in 2017 bid is immediately handicapped by questions about the huge loss incurred by the 2007 Worldcon in Japan whose full dimensions were only revealed this month. Bid spokespersons say funding for 2017 is separate. In a move to bolster their credibility they’ve added Vince Docherty to lead the finance division. A great deal more will need to be done to persuade voters that it is economically practical to hold another Worldcon in Japan. The New Orleans in 2018 Pre-Bid Committee is Raymond Boudreau (Chair), Michael Guerber, Cordelia (Colin) Murphy, Rebecca Smith, Stu Segal, Jessica Styons and Kendall Varnell. Committee member Jessica Styons told File 770, “Obviously we are in the early stages of building support, gauging interest and staking a claim but we are interested in all comments, offers of support and assistance.” Rebecca Smith, chair of CONtraflow, also is working on the bid. New Zealand in 2020 is led by Norman Cates, a past DUFF delegate. The general committee members are Kevin Maclean (New Zealand),Maree Pavletich (New Zealand), Lynelle Howell (New Zealand), Malcolm Fletcher (New Zealand), Louise McCully (New Zealand), Struan Judd (New Zealand), Daphne Lawless, Andrew Ivamy (Queensland, AU Agent), James Shields (European Agent). The committee says it’s an open question where they’d hold a Worldcon. There are said to be two facilities in Auckland and one in Wellington that could support a 1500-3000 member con.